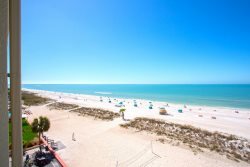 Explore the Gulf Coast with 35 miles of beautiful, sugar-sand beaches! With so many different options to choose from, we`re certain you will love our beaches! Here in the St. Pete/Tampa area there is NO shortage of restaurants and bars. From casual dining to fine, we have something for everyone! We are proud to say that our area is a melting pot of culture and art! From museums to vintage shuffleboard clubs, there is something for everyone! If you`re looking for family fun, the Tampa Bay/St Petersburg area offers thrill rides, water rides or an adventure into the past! Welcome to beautiful Florida, where we also have gorgeous golf courses and year-round warm weather for those who love to play! Do you love to shop? The Tampa Bay/St. Petersburg area offers plenty of shopping options for the whole family! Sports fan? We`ve got sports! The diverse community of our area means lots of special events and festivals. From sports events to seafood to chalk art festivals, there is always something interesting happening here on the sunny gulf coast! Check out the variety of dog-friendly parks and beaches for you and your furry friend! Also, keep in mind, many restaurants and bars in our area are dog friendly!